Partnership between Forest Service and Marys Peak Alliance will provide trained interpreters throughout the summer. 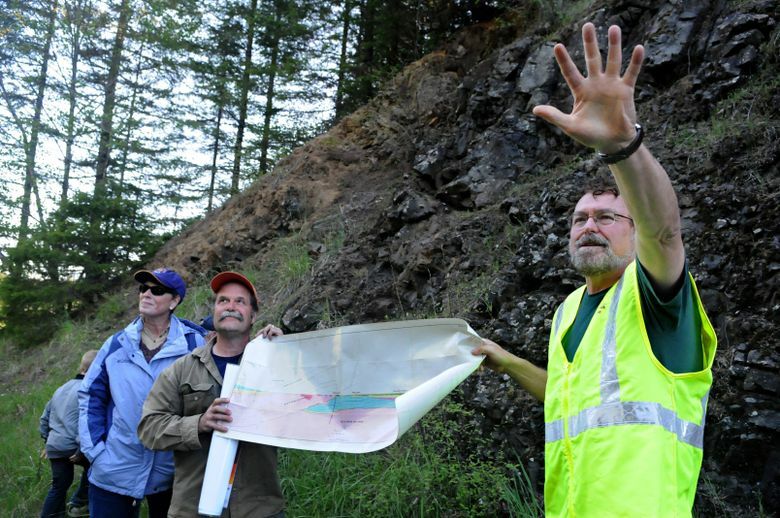 PHILOMATH, Ore. — Three miles up the Marys Peak Road, where the roadbed cuts through a ridge of dark volcanic rock, Bob Lillie is giving a geology lesson to a group of about 16 people. Clad in a bright yellow vest, Lillie — an emeritus professor of geology at Oregon State University — directs the group’s attention to some oddly rounded rock formations visible in the side of the roadcut. That’s right, Lillie says: The basaltic rocks that make up much of Marys Peak formed in volcanic eruptions on the deep ocean floor some 55 million years ago. Over time, those rocks were transported many miles to the east and thrust thousands of feet above sea level in the long, slow collision of tectonic plates that formed Oregon’s coastal mountains. Lillie’s mini-lecture is one of several the group received on a recent Thursday evening on a three-hour field trip to the top of 4,097-foot Marys Peak, the highest mountain in the Oregon Coast Range, and about 15 miles (as the crow flies) west of Corvallis in the Siuslaw National Forest. The educational outing is part of a crash course in the area’s geology, biology and human history for the Marys Peak Interpreters, a new cadre of volunteers who will soon start roaming the mountain in bright yellow vests like Lillie’s to provide background information to curious visitors. The interpreters-in-training also got 16 hours of classroom instruction last weekend that included both detailed information about the mountain’s cultural and natural history and tips on how to make that information interesting to casual visitors. Their first official assignment will be to act as guides for 190 Cheldelin Middle School students on June 13, and members of the group will be available for other organized tours in the future. Beginning in mid-June and continuing through the end of the summer, interpreters will work regular shifts Wednesday-Sunday, leading organized hikes at scheduled times or just making themselves available to assist and inform visitors at the mountain’s upper parking lot, on the summit and along the trails. The new volunteer guide service grew out of a partnership between the Siuslaw National Forest and the Marys Peak Alliance, a loose-knit group of area residents affiliated with the Alliance for Recreation and Natural Areas, a nonprofit formed to support parks and outdoor recreation in and around Benton County. The Marys Peak Alliance also offers educational presentations about the mountain and works with the public agencies, private timber companies and individual landowners that make up the checkerboard of property ownership on the peak. For fellow volunteer Stewart Holmes, who fell in love with Marys Peak shortly after moving to Corvallis in 1985 and hikes the mountain with his wife almost every month, signing up for the interpreters program seemed like a great way to stay busy in retirement. Lisa Romano, the public affairs officer for the Siuslaw National Forest, helped get the volunteer interpreters program off the ground in December, shortly after she transferred to the Siuslaw from her previous job at Mount St. Helens in Washington. She had helped launch a similar initiative there and had seen the value in that kind of public-private partnership. “The fact that Marys Peak Alliance formed at all was good news for the Siuslaw,” Romano said. Like national forests throughout the region, the Siuslaw has seen its staffing levels and budget shrink drastically over the last two decades in parallel with logging restrictions aimed at protecting the northern spotted owl and other old-growth-dependent species on federal land. The forest service provides insurance coverage for the interpreters while they’re on the job, and in return it gets trained and motivated volunteers providing a valuable service to forest visitors and providing additional oversight on the peak, which is generally staffed by a lone seasonal ranger. “Marys Peak gets a lot of visitors and it feels like it’s right in our backyard (but) we don’t have the kind of staff we used to have years ago,” Romano said. “Volunteers are a way of expanding our presence up on the peak,” she added.